View Marc Doty’s Timeline of Synthesis here, created to honor what would have been Bob Moog’s 80th birthday on May 23, 2014. Of course, it is not true. Bob Moog did not invent the synthesizer. He did, however, synthesize the history of electronic music technology and combine that synthesis with his own vision, ingenuity, talent, and musicianship to create what became the ultimate realization of a device for synthesis–the voltage-controlled modular synthesizer. 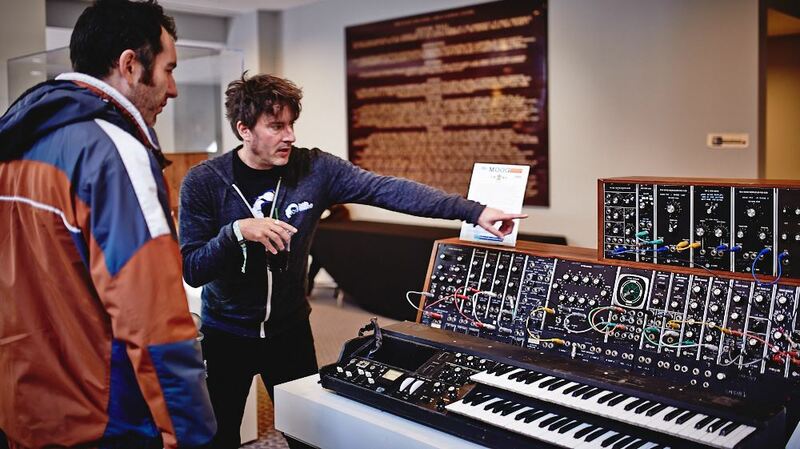 Bob Moog Foundation Archive and Education Specialist, Marc Doty, sharing an archival Moog Modular at the Mountain Oasis Electronic Music Summit, October 2013. This phrase is particularly apt in regard to the history of the synthesizer. If you were to ask “Well if Bob Moog didn’t do it, who did?” The answer would not be a single name. In fact, it’s a very challenging question to answer succinctly. The history of the synthesizer is a complex web of interlocking points of inspiration and innovation. As a history, the development of the synthesizer is an accretion of the work of various people over time…many pieces coming together to form a whole. As I have said elsewhere, the history of the synthesizer is an excellent example of synthesis! When I was in college, I wanted to learn about the history and culture that surrounded the synthesizer. The college I went to did not have an electronic music department, and the references to electronic music that existed in the curriculum were not robust. When I went to the head of the music department and talked to him about this, he suggested that I create my own curriculum in regard to electronic music. He gave me a number of names and resources and let me set up my own individual college course. It was then that I learned about the extremely complex nature of the history of the synthesizer. I’m the Archive and Education Specialist for the Bob Moog Foundation. The history of synthesis is particularly relevant in my work, as it’s important for me to know Bob Moog’s crucial role in that history. While I try to avoid the internet as source of information, I am also exposed to the internet a great deal in regard to my production of synthesis-related videos. I have been frustrated with the lack of accuracy and the abundance of misleading information present in the internet. I had frequently complained about these issues in meetings with the Foundation’s executive director, Michelle Moog-Koussa, and that inspired her to suggest that we create a broad yet accurate timeline of the development of synthesizers. For all of my complaints, I was somewhat daunted by this task. How, exactly, COULD I create an accurate timeline for the development of the synthesizer? The truth is, I couldn’t. As I suggested in the introduction to the timeline, the history of the synthesizer isn’t a line. It’s more like a tree with a complex system of branches and a root system, too. So many events in history can be portrayed as a linear set of developments where one development led to another. But as science and technology have become more and more complicated, inventions and their development are less and less frequently so concisely explained. A complete and detailed portrayal of the development of the synthesizer would require a vast website, or even a large book! So, what I have done is fashion a timeline that displays points that are relevant, sequential and “close to the trunk of the tree.” Rather than portray every person, device, and event, I selected the points where significant technological developments occurred, inventors, musicians, and technologists were inspired, and electronic musical devices were created. So my timeline also includes an underlying motivation for the inventors: composers inspiring them with their visions of the ideal outcome. It is my hope that this timeline will provide an accurate and inspiring portrayal of one major linear aspect of the complex web of invention and inspiration that is the history of the synthesizer. It is my wish that those who read it will feel motivated to seek out and discover the many important and interesting aspects of the history not portrayed in this timeline. It is truly a rich and fascinating history filled with the sort of inspiration and innovation that we at the Bob Moog Foundation promote through sharing the legacy of Bob Moog.